This file requires Microsoft Excel in order to open and use properly. 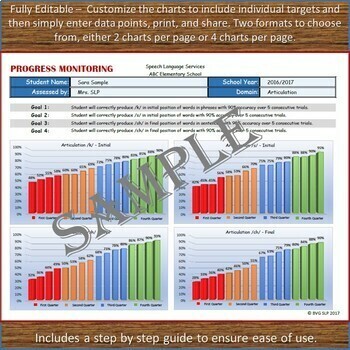 It includes fully customizable graphs that are automatically populated as you enter your students’ data. There are two formats to choose from so you can decide what works best for you and your students. 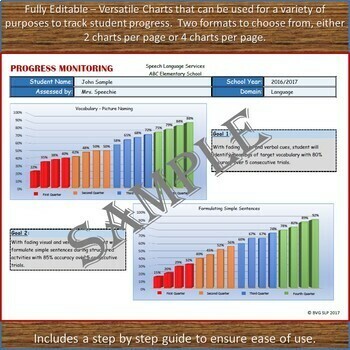 This product is very versatile and can be used to track student progress across a wide variety of domains. 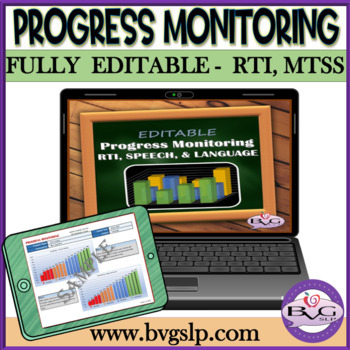 It is great to use as a visual aid when tracking RTI, MTSS, ETS, Speech and Language goals, or general quarterly monitoring. You will be able to EDIT the charts for continued use over and over again! You will also receive a step by step guide for ease of use. PLEASE NOTE: This file includes GRAPHS ONLY. It allows for the entry of up to 4 data points per quarter (in the percent correct format) for a full year of analysis. This visual aid serves as a great tool to share with your students, administrators, teachers and parents. For additional products that would be a great accompaniment, please visit my store and shop around for the following units: "Letter Names and Sounds", "Beginning and Ending Sounds", "Same or Different", "More or Less", "Rhyme Time", "Can You Describe That", "Articulation Bundle", "Expanding Sentences", and much more! Thank you for shopping with me and please follow my store to receive notifications on new products, sales, and promotions. Happy teaching!